When I said I'm doing overtime to pay for nappies and maternity wear, I was of course lying. I'm actually doing it so that I can afford to surf the internet buying cheap imported baby gadgets from China. 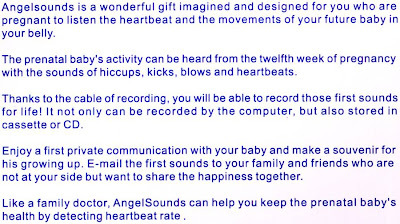 I was halfway through a cheese and ham bagel at lunchtime on Thursday when Lisa phoned me from work to say that one of her colleagues had mentioned that you can buy "things which let you listen to the baby's heartbeat at home". Ten minutes later I'd ordered one from Amazon. I couldn't afford to hang around - Lisa's only pregnant for another five months. The manufacturers obviously understood the urgency, and having received my order at 1:45pm on Thursday, they managed to deliver the thing at 8:30am the next morning. It's called a 'Foetal Doppler', and is named after a famous Austrian physicist of the 19th century. Which is surprising because the name Foetal sounds more Dutch to me. I was obviously keen to give it a go, but sadly Lisa was out with friends on Friday evening, so I was forced to stay at home alone, reading the instructions and wondering if it would work on a cat. Fortunately Lisa soon returned with my future baby in her belly, I plugged in the cable of recording, and like a family doctor, it allowed us to enjoy a private communication of kicks and blows with our prenatal baby. The way that heart's pounding, I think it's already panicking about who its parents are. A passer-by I see you have decided your baby is going to be a boy, as you have bought equipment to "make a souvenir for his growing up." 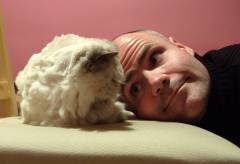 Must be the continuation of your skill at predicting the future from two and a half years ago (see Lloyd Cole blog). Phil's Mum How amazing! I think he/she is already getting excited about seeing you coming home from work with your overtime pay! When do you get to hear the cries of "Daddy"? Phil Not until I agree to take out my earplugs. Kristy If it's a boy, please consider naming it Timmy. There's been a far too little Timmy on this site in recent months, so it might be a sort of compensation. Congratulations! a sympathiser You shouldn't call your baby Timmy - he might throw up on your table and wee in your shoes! But the there's probably not a lot of difference between cats and babies - apart from fur! 'old' friend from Bexhill Aah! Magic moments. Where's Big Sis by the way? She's been very quiet recently. Also, where's Dave gone? What have I missed? Phil's Mum I believe Dave has gone up to the frozen north for 3 weeks' break. As for Big Sis, she just keeps going up in the sky! I suppose she comes down sometimes, but is too busy querying why she only got 96% in one of her exams (as opposed to 98,98 & 100%) to have time to visit here with the rabble! How is 'old' friend's better half? 'old' friend from Bexhill Nice life for some! Other half is ok thanks, although still waiting for the results of his blood test. Back's still not so good either. The joys of 'old' age!! Speaking of which...are there any plans for November this year - a wake perhaps?! Phil's Mum Being 'old' (in Bexhill) hasn't affected your memory! No plans at the moment. We may not even be living together by then! 'old' friend from Bexhill Hope that last comment Phil's Mum sounds worse than it is!!!! Am looking forward to the re-grouping of various folk. Phil's Mum I'm thinking of planning an Old Timers' Coffee Morning - we can discuss our grand-children!!! Will explain the living apart reference another time!